One of our readers recently asked: "What percentage of storefront crashes result in the kinds of design changes/barriers to protect people from a 'repeat' versus the store/building owner sweeping up, boarding up and then simply repairing the storefront to its former unprotected state—waiting for the next victim?" Great question. (Thanks, Charles!) It's one of many I have for businesses that have suffered a crash into their building. 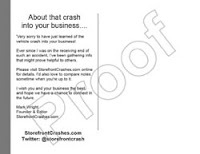 To begin the process of engaging more with those businesses, I just mailed a hot-off-the-press postcard to several that were featured in recent crash reports. The postcard invites them to visit and connect here via this site. Part one: I'm really sorry your business got hit—even more so if any customers or employees were hurt. As you can see from all the accident examples here on StorefrontCrashes.com, you are in good company—not that that alone will make you feel much better right now. Is there anything you need, any information you don't already have, that would help you and your business recover faster? Part two: Would you be open to sharing your story and any lessons learned with others? What did you have to go through—cleaning up, boarding up, closing down? What did you experience in dealing with first responders, insurance companies, building inspectors? If you had to close temporarily, what effects did that have on your business? Most importantly, how are your customers and employees doing since the event? If you had to go through it all again, Heaven forbid, what would you do differently? Your story is truly valuable to others. Thank you for anything you can offer from this accident experience that might save another business owner headaches, heartaches and time. Of course the postcards are only one mode of outreach. I'll be calling and emailing crash-site businesses, too. We'll see what works best. Let me also assure those businesses: I'm all about seeking solutions, not blaming or finding fault. So don't be shy. I look forward to our conversations and to exploring ways you, your customers and your employees can be protected from a future out-of-control driver.